This June, the #1 Adult Swim show will teleport into homes when Rick and Morty: The Complete Second Season debuts on Blu-ray™ and DVD June 7th. The release features all 10 of the hilarious inter-dimensional episodes with guest stars Stephen Colbert (The Late Show with Stephen Colbert), Keith David (Community), Tom Kenny (Adventure Time) and more! Plus exclusive special features such as deleted animatic sketches, as well as animatics for every episode including an alternative version of this season’s first episode. Other bonus features include commentaries for every episode with guest commentary tracks. 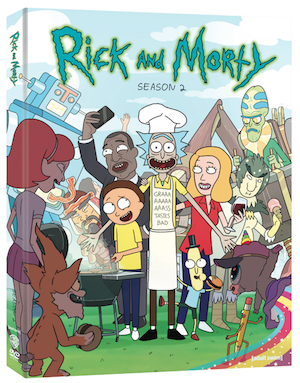 Furthermore, each Blu-Ray™ and DVD contains a featurette of the season’s premiere party with live drawing/animation by the series’ creator Justin Roiland (House of Cosbys) and a performance by the band Chaos Chaos. Lastly, and most importantly, the release comes with a manual for the fictional, yet essential, household item - the Plumbus - created by Roiland.